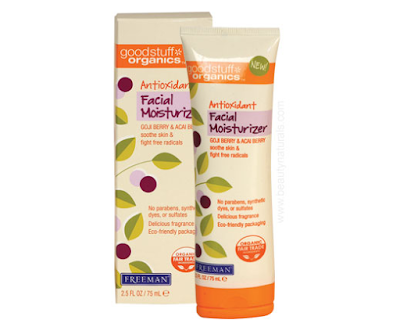 Facial moisturisers can be expensive but Goodstuff Organics Goji Berry & Acai Berry Antioxidant moisturiser is a bargain. This brand is from USA but I discovered it at Beautynaturals.com. I have dry skin and this moisturiser is hydrating despite it's light texture. I adore the fragrance it is extremely fruity so may not appeal to all. Best of all it contains fair trade ingredients but no parabens, synthetic dyes or sulphates and is not tested on animals. As you will see from the picture the packaging is simple but colourful and appealing, it is also eco-friendly. If you are on a budget and wish to avoid certain ingredients in your moisturiser you might want to try this one. This product does contain preservatives which have been associated with skin irritation, it is not 100% natural but it's a compromise.